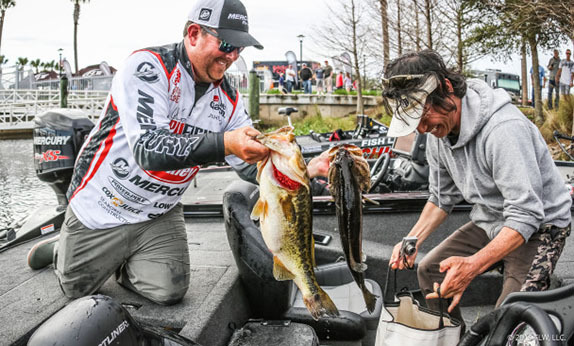 Buddy Gross caught most of his winning fish at the Lake Toho FLW Tour from one small location. Buddy Gross was worried his key spot was fished out. He couldn’t have been more wrong. The Georgia pro put on an early show on the final day of the Lake Toho FLW Tour. He had a 20-plus-pound limit by 8:30 a.m. and never looked back, bringing in the day’s biggest bag at 23-12. His final weight of 85-12 was enough to hold off a late charge from John Cox (23-10 today, 81-02 total) to take home his second Tour victory. 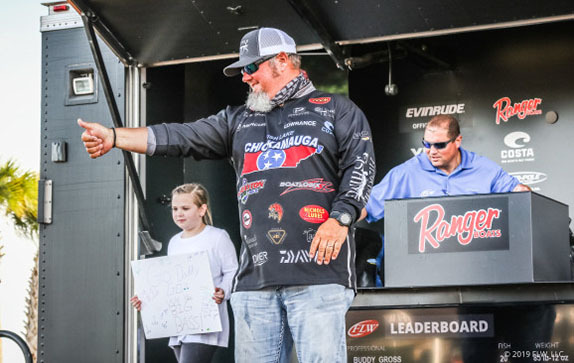 Darrell Davis also could’ve given Gross a scare and possibly even won had he not lost a pair of 5-pounders and an 8-pounder that came off late. Instead, he finished 3rd with 78-07. 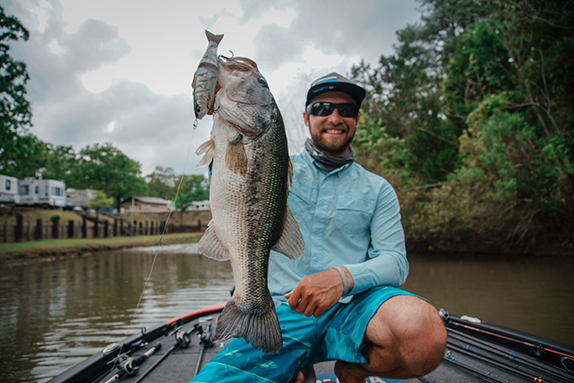 Tommy Dickerson also can only wonder "what if" as his offshore shell-bar bite came alive with the weekend’s wind. After sitting in 61st on day 1, he squeaked into the top 30 before cracking 24-01 and 22-11 bags on the weekend to finish 4th with 76-14. But while the weekend’s weather helped Dickerson, it killed Josh Douglas, who was focusing on spawning fish around lily pads and needed the sun to pull them up. When the sun left, so did his bite, and he brought in just 12-05 today to finish 5th with 72-08. The rest of the top 10 consisted of Wade Strelic (71-04), Joseph Webster (66-00), Scott Martin (65-10), Aaron Britt (64-07) and Tyler Wolcott (64-03). “I’m glad that spot saved its best day for today,” Gross said. “That spot” was a tiny indent in an offshore grass flat of Toho where bass were sitting on the edges and then trapping bait that swam into the channel. Once he realized just how good it was on day 1 and the lone, precise cast he had to make to fish it, he milked it for all it was worth. Today, he said he caught his first fish on his third cast. Then he caught one on this fourth and another on his sixth. He figures he had the majority of his weight by 9 o'clock, though that didn’t stop him from “busting that spot up as long as I could and as hard as I could” throughout the rest of the day. All told, 19 of the 20 fish he weighed in throughout the tournament came from that tiny indent, and he caught the majority of them on one bait: a white swim jig with a Scottsboro Tackle swimbait trailer. He also mixed in a Scottsboro Tackle swimbait on an 8/0 Owner Beast Flashy Swimmer, another black-and-blue swim jig with a green-pumpkin Zoom Z Craw trailer and a Nichols Lures spinnerbait. Obviously, Gross had no complaints about his special spot, though it did make things interesting. Once again, it failed to give up a true Florida kicker – he never weighed in a fish bigger than 5 1/2 pounds all week. 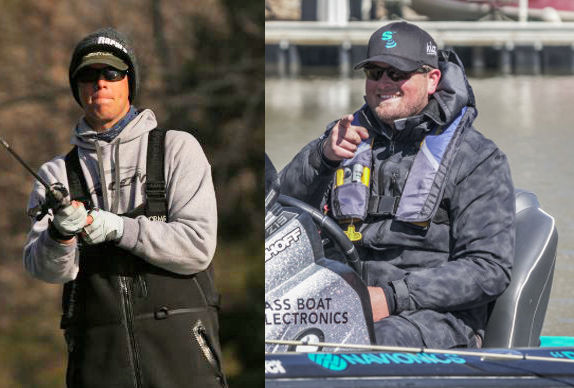 Considering the number of 8-, 9- and 10-pounders the lake had given up, Gross said he was nervous up until his name was called as the champion for fear someone had caught a game-changing giant. John Cox made a strong final-day run at recapturing the top spot in the standings, but came up a few pounds short. Fortunately for Gross, no one cracked a double-digit fish, but Cox came the closest with his 7-09 kicker. The leader after days 1 and 2, Cox stumbled hard when his gamble to focus on sight-fishing in Tiger on day 3 only resulted in 8-11. So today he scrapped his plan and started off fishing shell beds in Kissimmee and Cypress. Tossing a Berkley Powerbait Wind Up on a Dirty Jigs Pivot Point Football Head, he managed a quick 6-pounder and a few keepers before he got the itch to run back shallow. It paid off, as he saw the 7-09 locked on a bed while flipping lily pads. 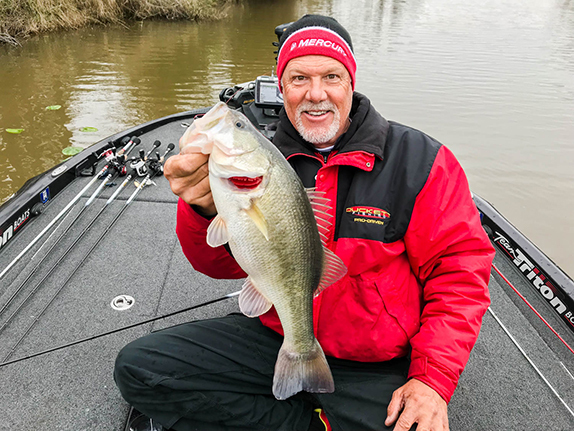 He ended his day catching a couple more good ones on Toho – one flipping mats with a Berkley Powerbait The General and another on the Wind Up – that made things interesting at weigh-in. Still, Cox was left knowing he lost the tournament the prior day. Davis was also left with regrets thanks to a number of big fish that got off today. Tossing a Reaction Innovations Trixie Shark in Tiger, Davis watched a pair of 5-pounders eat his lure, only to never get a hook in either. The 8-pounder he did hook, but she came unbuttoned right next to the boat. “I was on the fish to win, no doubt about that,” Davis said. “I just didn’t capitalize. I lost a good one yesterday and those three today. > Day 4 stats – 10 anglers, 9 limits, 1 four.